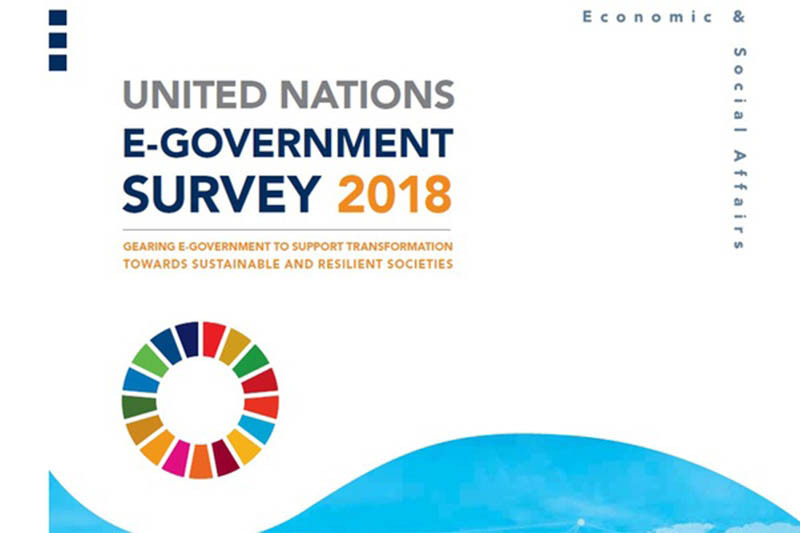 The 2018 United Nations E-Government Survey (hereinafter referred to as “the Survey”) is issued at the time of key rapid technological changes, with Member States in the third year of the implementation of the Sustainable Development Goals (SDGs). The Survey provides new analysis and evidence to further utilize the potential of e-government to support the 2030 Agenda. This particular edition examines how governments can use e-government and information technologies to build sustainable and resilient societies. The Survey is the only global report that assesses the e-government development status of all Member States of the United Nations. The assessment rates the e-government performance of countries relative to one another, as opposed to being an absolute measurement. It recognizes that each country should decide upon the level and extent of its e-government initiatives in keeping with its own national development priorities and achieving the Sustainable Development Goals. A country’s ranking in the survey is determined by the EGDI – E-Government Development Index, which is a weighted average of three normalized scores. The first is the scope and quality of their online services, which is measured by the Online Service Index (OSI). The second is the Development status of telecommunication infrastructure measured by the telecommunication infrastructure index (TII) and the third is the Inherent human capital, measured by the Human Capital Index (HCI). The OSI is measured by the number the quality and scope of the e-government and public service provisions online. In the 5 years, Malaysia has digitally transformed their government services. Including, having 83% of their government services being available online. These government services are integrated and aim to provide inclusive and a citizen centric digital service to all Malaysians. This has allowed the Malaysian government to strengthen leadership and governance for the planning and coordination of their digital initiatives, allowing them to be able to strengthen their ICT management and become more dynamic and efficient. The measure of The Telecommunication Infrastructure Index (TII) is an arithmetic average composite of five indicators. These indicators aim to show how technologically advanced the inhabitants of a particular country is. The Malaysia government have been increasing their investments on the technology and innovation sector in Malaysia. This has allowed even the bottom 40% of people in the income pyramid to have access to e-services. Making e-services easily accessible even to people of lower socio-economic status reduces the digital divide that is potent and extensive across the South East Asian region. Malaysia’s initiatives to reduce this digital divide is in-line with the UN’s goals of boosting access to science and technology to people of all walks of life. Malaysia has also managed to climb in their rankings when it comes to the Human Capital Index (HCI). In Malaysia, the “Digi Wanita Era Digital (DigiWED)” nationwide initiative – a public private partnership between Digi Telecommunications (Digi), the Malaysian Communications and Multimedia Commission (MCMC) and the National Council of Women’s Organizations (NCWO) – is seeking to educate and integrate women into the online community. DigiWED is using the 1Malaysia Internet Centers to conduct basic ICT training and to introduce women to safe usage of smart devices and the Internet. Due to their significant efforts in strengthening their Human Capital through cybersecurity, Malaysia was ranked third in Cybersecurity. These ten countries managed to establish coherent cybersecurity strategies while significantly improving their ICT mechanisms. Since these Member States are leaders in their regions, they could foster the creation and development of different forms of collaboration with neighbouring countries to improve regional cybersecurity cooperation. Malaysia’s persistent efforts and innovative initiatives has enabled them to climb the rankings, propelling them upwards by 12 ranks from 60 to 48 in the past two years. Although they are constantly faced with many persistent and dynamic challenges, Malaysia remains optimistic when it comes to their digital transformation and e-governance.